Independent Citizen Media - EXTRA! A Free Press Citizen News Network! 2 Vans headed to SHUT DOWN CREECH: Leaving from East Bay, funded by National CODEPINK Make Reservations now please! In memory of Pirate Mike, founder of Occupy Veterans San Francisco, member of Veterans For Peace, I urge any and all of his able bodied comrades, to JOIN us either in one of the vans or drive yourself and bring friends! We rode our bikes there last year.... I plan to be there this year! Emily Yates, playful and upbeat singer/songwriter/banjo-ukulele musician is likely to be on the Mar. 29 van. She is almost 100% committed to come to Creech and hopes to play in the Camp Justice Concert on Thurs., Mar. 31. For the BEAUTIFUL PEOPLE of AFGHANISTAN, won't you join us at Creech to Stand Together to STOP DRONES? Please sign up soon so we can better plan. If pictures are worth a thousand words.... video says so much more. Demonstrating, generally on a daily basis, for multiple reasons including survival, public awareness, and resisting the establishment in its current distorted form of a self-proclaimed "advanced civilization".... personally don't see it.... if we are so advanced or civilized why are we still killing each-other over land, oil, energy, and religious beliefs? No other species murders its own on the levels humans do, and we are the only species to "pay" to live on our home planet, all the while thinking WE are superior to all other creatures. "Accountability should rightly lead to trust, and as we have seen, the United States Government has not been particularly forthcoming in the past. So the People are justified in their suspicions, and should be allowed to express this mistrust. We stand vehemently opposed to all suppression of the People's Voice, and our rights to expression and free speech. Veterans must stand ready to defend themselves and others at demonstrations, rallies,direct actions or any other event that expresses the will of the people, and must come to realize that the ongoing defense of our way of life does not end with our military career. Rather, the veterans is free to serve the Nation by direct service to his or her fellow country men, and the new duty is to ones' fellow human being, rather than Militaristic Agendas. Organized homeless veterans can act as firewalls between the people and the Establishment, particularly as concerns hostile police action, and provide valuable conduits of information. Preeminently qualified for the rigors of outdoor life, and having witnessed first hand the incompetence, corruption and waste of our military state of affairs, many of these are people caught in a state of arrested development, with a potential for radicalization that cannot be overstated, with skill sets and experience equal if not superior to civilian police organizations. Since many veterans, indeed, many people, prefer the out of doors life style, be it self determined or enforced homelessness, local harassment laws and obsolete codes pertaining to trespassing,camping, vagrancy and loitering will be challenged and forced to be reconsidered in terms of human necessity, and eventually such acts will be decriminalized. If the regulations, rules, codes, laws or any other legal mechanism are a violation of an individuals autonomous and necessary action, whether political, symbolic, or by virtue of physical necessity, these devices will be ignored and resisted, the counter measures amplified, and repeated. We will maintain a non-violent orientation as a group, but will conduct appropriate actions as direct responses to Establishment provocation. Again, these may be of varying degrees of legality, but the bottom line is that “the law” is the only area where we as The People have an equal footing with our oppressors. We too must use force, properly applied or leveraged, to make an impression on the Establishment, that we will not be silenced or marginalized. The force of our voices, our bodies, our message. We are now serving the people in a direct manner, actively engaged with the Adversaries of Life and Liberty, the War Mongers and corporate pundits, the apathy and despair, the material and spiritual poverty foisted upon us by a broken system. We are no longer the puppet drones of an oligarchy, we are former members of the Military, we are no longer victims of deceit, and we are still determined to Serve. We will defend the people we share our communities with, and we will defend the planet, and we will defend the American Ideal, for we are no longer forced to “defend” any corporate or government agenda. We are no longer obliged to fight a rich mans' war with a poor mans' blood. We will show them just what SOLIDARITY really means. We will recover our country,but we must recover our veterans, our families and neighborhoods first. We must secure our positions and gird ourselves with the sword of Truth, and the armor of Love. The Homeless Veteran is part of a nation within a nation, and we are being exploited just as surely as we were conned during our service. We must stand up for each other, and we must use our skills and experience to defend our way of life, and the rights of others. The Establishment will attempt to manipulate our Active Duty brothers and sisters against us, we know this. So we as veterans must do all we can to reach out, to reach in to them, and to educate the public about the agenda of the war mongers and their eternal program to have Neverending War so they, the criminals, can “rule the world” at our expense. ALERT!!! All Hands on Deck! NorCal 420 Growers vs WATER Rights! instead of the illegal growers -- for the water waste and environmental damage that they have caused. Crunch Nestle Campaign, Essence of Life Project. Supervisors to initiate special rules regarding the watering of medical Cannabis plants. overly restrictive laws in Sacramento county is as wasteful as watering one’s lawn or driveway is insensitive, if not cruel. This illconceived amendment will needlessly double the fines on smalltime marijuana growers. The committee hopes to finalize a pilot permitting program in the Central Valley by October 2015.
an estimated 3,00012,000 acrefeet of water yearly. possibility for public comment. We ask that the supervisors remove it from the ordinance. Two prominent Bay Area Veterans Advocacy groups have announced plans to conduct a transnational bicycle ride to publicize and heighten public awareness of veterans issues such as climbing suicide rates and homelessness, national budgeting concerns and the increased militarization of our cities. The campaign, dubbed the “Jacob George Memorial Bike Ride for Peace” will cover the entirety of the west coast before turning eastward to Arkansas to honor the memory and work of Jacob George, an army veteran from Arkansas who, after having completed 3 tours of Afghanistan, dedicated the rest of his life to peace. Jacob committed suicide in September of 2014. Veterans for Peace San Francisco chapter 69 and Occupy Veterans San Francisco hope that the public awareness campaign will open localized discussion regarding the national concerns that the groups feel reflect the “true costs of war: personal,social ,and environmental disintegration. 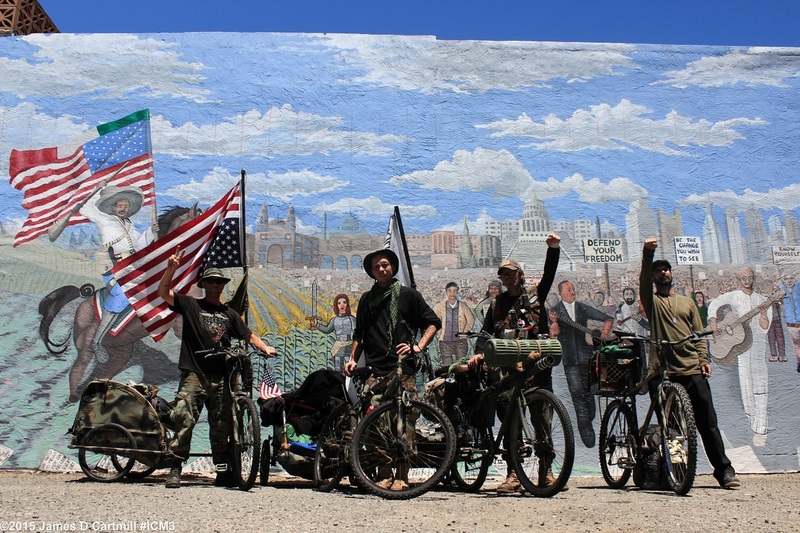 An Occupy Veterans San Francisco group of mixed era military veterans will spearhead the effort with a “flying squad” of four cyclists bound for the Veterans for Peace National Convention to be held in San Diego, CA August 5 through 9. The cyclists will depart from San Diego at the conclusion of the convention on August 9. CALLING ALL HANDS ON DECK!!! This was sent anonymously to #ICM3 for immediate release. George Friedman, CEO of Stratfor is having a book signing. If you are unfamiliar with Statfor, I will include some links below in this message. I realize we are working on short notice, but I hope as a team, SF can make something happen. It would be great to see people protesting outside the book signing with signs, bullhorns, and our usual. Also, it would be lovely to get some footage, (both pictures and video. SF has such a great media team!) of the Q&A session. We would need some people who are familiar with Statfor and/or people who can read up on it and ask George some of the uncomfortable questions publicly. At his signing in Austin TX, people asked him why he took money from Dow chemical to spy on victims of the Bhopal disaster, why did he cooperate with the FBI and allow his company to be hacked. He tried to explain Stratfors actions by saying Jeremy altered nearly 5 million emails lol. Funny since they were in the hands of the Feds. The 1st link I'm going to share with you explains exactly what Stratfor was up to and how dangerous they are to the activism community. If you are familiar with Jeremy Hammond, or Barrett Brown (who was just sentenced to 63 months in jail FOR POSTING A LINK). Watch out journalists. The govt is trying to send a message about how they can infringe on your rights! "Hi folksI was on a plane returning from Ashland North Carolina from our 2014 convention and struck up a conversation with a man sitting next to me. I had on my VFP shirt and he inquired about our organization. I told him all about our VFP and than shared with him our "Best Practice" ,the distribution of sleeping bags. He was impressed and said that he was the general manager of a very large shoe company. Bottom line he said that he wanted to contribute brand new shoes to our organization. This coming Wed. we will be picking up over 7000 pair of shoes (yes the number is correct 7000 pair of shoes) of various kinds Please see the pictures and listing. They will be delivered to the Veterans Village in San Diego who will distribute them to our homeless vets and other homeless people. Lesson Learned:Wear your VFP shirt often and find reasons to talk up our "Mission". Yes,even with strangers because you never know who you are talking to.Jack"
"If you are interested and have a truck (we do not), we can make arrangements to go along with your truck to pick up as many of the shoes as you wish. Time is of the essence as the distributor would like to donate the shoes by the end of January. I am available anytime to discuss." "Gil Field past president of San Diego Chapter 91 has been working with me on the pickup for the shoes. We will have a large truck that we will use to pick them up.We have no place to store them so we contacted a wonderful organization in San Diego called:Veterans Village of San Diego that will make the distribution to the homeless. Mr. Wong and his company are extremely generous." "To act as a vehicle in aiding all the chapters of Veterans for peace, by providing tools that can be used to help homeless veterans and their families. Practices” (proven ways to help the homeless) These Best Practices, gathered from various chapters throughout the United States, have already been proven to help the homeless. Bottom line, it will enable any chapter in the United States to adopt one or more of these Best Practices and put them into play in their cities." This PDF is open source, feel free to download, implement, modify, upgrade, and update as necessary. No words are needed... 3:34 I think the video speaks for itself.